We've been in our trailer for over two weeks now. I feel pretty spoiled in it. So far the most exciting event was discovering a mole had made a mound around our electrical connection when we broke down our first camp. We can handle this kind of stress, in fact we laughed at it. Now we are already camped at home number two. It felt so good to break down camp, move and set back up. In all our years we've never really had an extended period of trying times until this year. In fact I cannot think of any time in the last 28 years where we had to live in a house with other people. Now we can say we were sucessful at living with Hub's parents for five months! We survived trying times and stayed focused on the light at the end of the tunnet and here we are! Last week I tried something new. Something I never thought I would do. 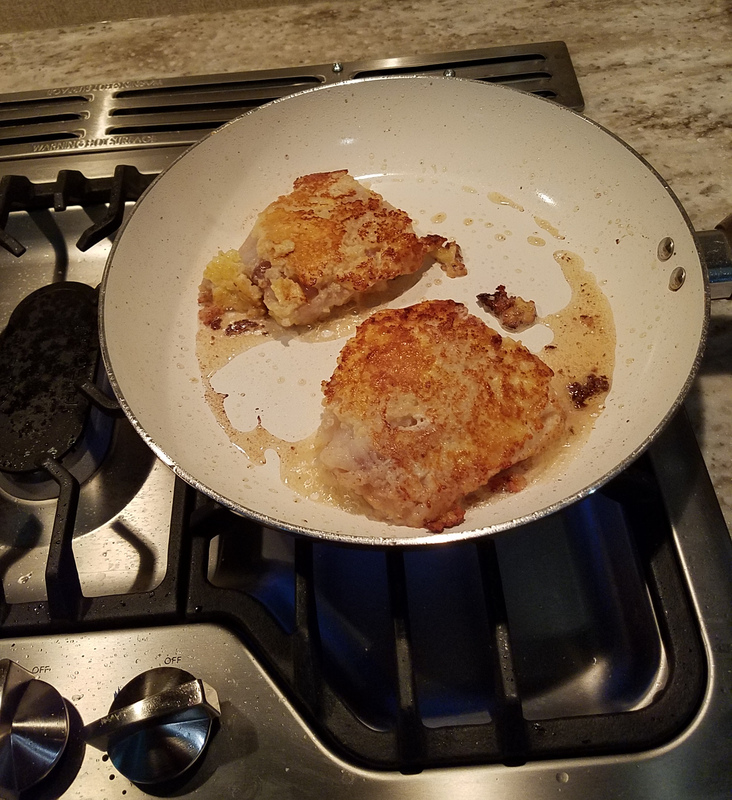 I don't normally cook our meals. And fish being cooked in a trailer is risky. I am still amazed Hub let me try it. Sure I will use the microwave and make sandwiches, etc, but very rarely will I actually cook something. 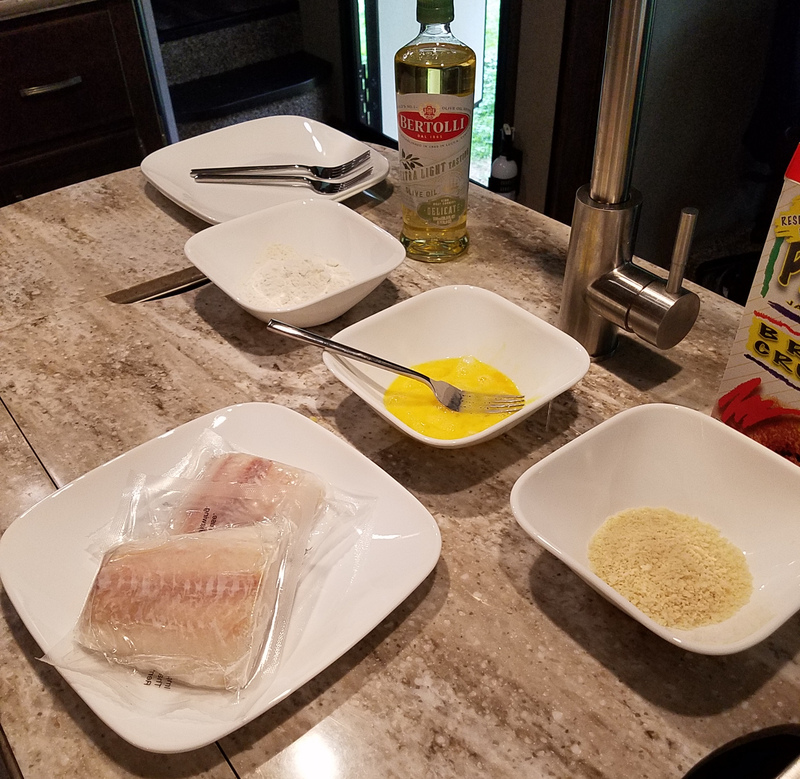 Because of our fancy new kitchen and all new kitchen everything, I was inspired to cook some cod. We like to buy pre-cooked, battered cod, and accidently bought some cod that had a picture of battered, but alas it was not. I bought Panko crumbs, then saw we needed flour, so Hub brought home the tiniest package of flour I have ever seen. Armed with all the necessary ingredients I followed an easy online recipe. Our kitchen makes me feel like a pampered chet (no pun intended). In addition, Hub bought all of the kitchen supplies so cooking in my kitchen is like cooking in someone else's kitchen. We've had our original kitchen provisions for many years, in fact most of the items were wedding gifts! Everything is so different than it was back in 1990! 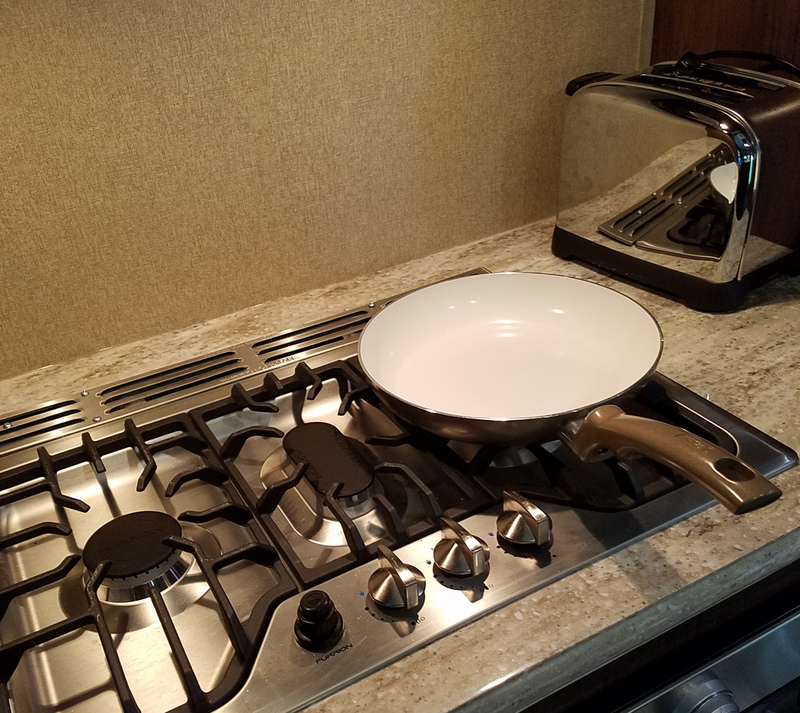 First, I didn't even know that they make white lined frying pans, and yet, we now have a full set of white pots and pans And what is with the square bowls and plates? I do think they look very cool and appeal to my clean and simple style. And here is my carefully prepared fish frying happily. The fish came out great! The trailer did not smell like fish. I did NOT make a big mess even with flour, eggs and oil, all messy things should disaster strike. I was amazed at how much space is left for more kitchen gadgetry. I also noted a few items we lacked: basics like a potato peeler, egg slicer and wooden utensils to prevent scratches on our new white pots and pans. I made a list and have already done my part in the provisioning by acquiring these and a few more necessities, you kno important camping must haves like corn cob skewers!